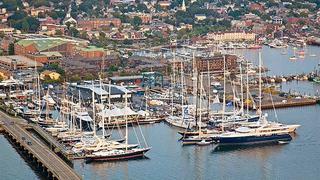 Yachts under refit are becoming larger, and most of the yards are upgrading their facilities. Newport Shipyard follows the trend by announcing the purchase of a new 500 Metric ton Marine Travelift. This new Travelift will become the largest one in New England, and will replace the current 300 MT lift purchased 12 years ago. Special features include night time work lights for emergency haul outs and a sound suppression package to reduce engine noise. "This is a very exciting time not only for Newport Shipyard but also the Marine Industry in Rhode Island," said Eli Dana, dockmaster at Newport Shipyard. "Until now, we were able to haul yachts up to 46 metres but as sailing and motor yachts continue to grow in size, the need for a larger hoist became necessary". Scheduled to be operational in June 2013, the new 500 MT Travelift will be able to handle yachts from 15.2m wide and 61m in length.